Once again, winter in Morocco has surprised me. 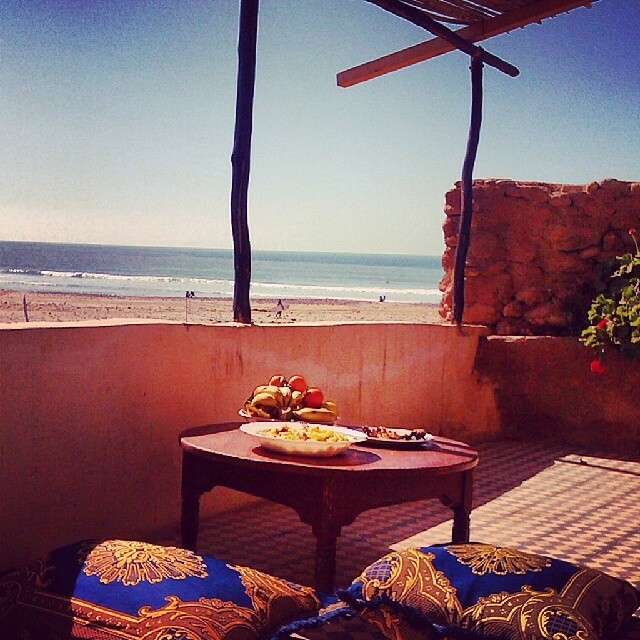 We have moved back in to our little Moroccan house: the little shack on the beach. Mosaic floors, stone walls et al. A house built for Moroccan summers – not for freezing desert nights. Il fait froid is my French phrase for the day. I feel so lucky to call so many places home. Yet here I am, emerging from a cold shower, and dreaming about a warm bath. As I wait for the sun to rise, along with the mercury, I’ll post an excerpt from an article that I wrote for The New Betty, The Poet’s Guide to the Perfect Bath. Moroccan mornings don’t stay cold for long. Later today I’ll run barefoot on the beach, maybe even go for a surf. The early morning is for dreaming, and I am more than ok with that. In our collective imagination, a Poetic License is a freedom to tell a story unburdened by the truth. Perhaps it runs deeper than this. Maybe a Poetic License is actually a freedom to live a life unencumbered by normality. We expect artists to live, dress, and communicate in a way that rubs against the norm. We call this friction creativity. A Poetic License allows artists to find romance, philosophy and beauty in life’s mundanities. Sylvia Plath once mused that “There must be quite a few things that a hot bath won’t cure, but I don’t know many off them”. In the spirit of Plath, this guide looks at the humble bath through an artist’s eyes. Of course, unless you’re Archimedes, the perfect bath will not change the world. I do know, however, that after a bath I often emerge reenergized, with a deep feeling of renewal. That’s what I hope that you get from this guide. A renewed perspective: A sense that art and poetry can give you a new way of seeing the world. That, I believe, is the first step to changing it. The big secret about the Poetic License is that there is no issuing authority. It is up to you to decide to live a life unencumbered by normality. You can find romance, philosophy and beauty in anything. Even if it’s just a bath. This entry was posted by Alex in Featured, Travel The World	and tagged Africa, Beauty, French, Health, Morocco, Travel.